This is a comprehensive guide to building healthy congregational attitudes and practices toward managing and spending financial resources. Much has been written about how churches can raise money. Less guidance is available to congregations about what to do with financial resources once they have been gathered in. Even less has been offered by way of a comprehensive view of congregational finances, one that demonstrates how individual attitudes toward giving money and congregational attitudes toward managing and spending money are inextricably linked together. In this book Michael Durall paints a wide-ranging picture of how churches can engender healthy attitudes and practices toward money among their members. How can churches counteract the consumerist mentality in society in ways that lead to simpler living and more sacrificial giving? How can churches tell which stewardship practices and programs are genuinely helpful, and which are seriously outdated? How can we build a strong bond between the day-to-day lives of parishioners and their charitable giving? What opportunities for better stewardship do the unique natures of each individual congregation present? Written for pastors, finance committees, and everyone involved in the financial life of congregations, Beyond the Collection Plate will serve as an indispensable guide to how the priorities of God's kingdom can determine how money in the church is raised, managed, and spent. This book is intended to help readers strengthen the bond between parishioners' daily lives and their charitable giving. It analyzes prevailing attitudes in church toward giving and managing money, demonstrates how many prevailing practices in stewardship campaigns and fundraising have lost their effectiveness, and provides strategies for encouraging more sacrificial giving. 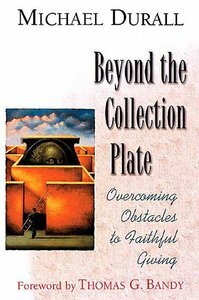 About "Beyond the Collection Plate"
MICHAEL DURALL is principal of Common Wealth Consulting Group, and author of Creating Congregations of Generous People.